Barcelona star Lionel Messi grabbed both goals as the Catalans saw off FC Copenhagen 2-0 to move to the top of Group D.
But the 2009 champions did not have it all their own way against a resolute Danish side, with the game in the balance until Messi's second in injury time. Ex-Real Madrid striker Raul also grabbed a brace as he set Schalke en route to a 3-1 victory over Hapoel Tel Aviv. The goals saw him move level with German legend Gerd Muller at the top of the list of all-time scorers in European football. A brilliant Gareth Bale hat-trick almost helped Tottenham grab an unlikely point away to Inter Milan in the San Siro. Spurs played much of the game with 10 men after goalkeeper Heurelho Gomes was sent off and Inter took a 4-0 lead after only 35 minutes. Bale grabbed three goals, including two in injury time, but it was not enough to prevent Inter going three points clear of the group. FC Twente and Werder Bremen remain winless in Group A after sharing a 1-1 draw in a keenly contested encounter. Theo Janssen opened the scoring for the hosts after 75 minutes but substitute Marko Arnautovic popped up with the equaliser for Bremen only five minutes later. Lyon made it three wins out of three with a comfortable 2-0 victory at home to 10-man Benfica. Goals in either half from Jimmy Briand and Lisandro Lopez were enough to see off the Portuguese, for whom Nicolas Gaitan was dismissed before half-time. Raul grabbed his 68th and 69th goals in Europe to set Schalke on their way to a 3-1 victory as they dominated Hapoel Tel Aviv. A further strike from Jose Manuel Jurado ensured Schalke go second in Group B, although there was still time for Itay Shechter to grab a late consolation for the visitors. Manchester United were far from their best as they produced a subdued performance in beating Bursaspor 1-0. Nani got a stunning early goal but United, still reeling from the news striker Wayne Rooney wants to leave, had to settle for a slender win against a side that has yet to score in the competition. Maurice Edu scored at both ends as Rangers and Valencia shared the points in an entertaining encounter at Ibrox. The United States international headed Rangers into a first-half lead but then nodded into his own net a minute after the break as the Scottish side slipped two points behind United. 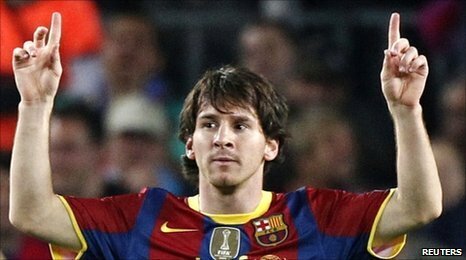 Barcelona had Lionel Messi to thank for a nervy 2-0 win over a well-drilled FC Copenhagen side at the Nou Camp. Messi opened the scoring when he controlled a pass from Andres Iniesta and thumped the ball into the top left corner from just outside the penalty area. The home side had plenty of the ball and chances to finish off the visitors, but they lacked their usual cutting edge and were almost made to pay when Dame N'Doye rattled a shot off the crossbar. But Messi tapped in from close range in injury time as Barcelona overtook their opponents to go top. Panathinaikos clinched their first point after a draw with Rubin Kazan that leaves both sides facing an uphill task to progress to the knockout stages.